For the British Second World War tank, see Covenanter tank. "National Covenant" redirects here. For the 1949 petition calling for Scottish home rule, see Scottish Covenant. 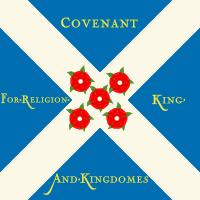 Flag used by Scottish Covenanters. The Covenanters are so named for the series of bands or covenants by which the adherents bound themselves to maintain the Presbyterian doctrine and polity as the sole form of religion of their country. The first "godly band" of the Lords of the Congregation and their followers is dated December 1557; but more important is the covenant of 1581, drawn up by John Craig in consequence of the strenuous efforts Roman Catholics were making to regain their hold upon Scotland, and called the King's Confession or Negative Confession. Based on the Scots Confession of Faith of 1560, this document denounced the Pope and the doctrines of the Roman Catholic Church in no measured terms. It was adopted by the General Assembly of the Church of Scotland, signed by King James VI and his household, and enjoined on persons of all ranks and classes, and was subscribed to again in 1590 and 1596. In 1637, Scotland was in a state of turmoil. King Charles I and William Laud, Archbishop of Canterbury, met with a reverse in their efforts to impose a new liturgy on the Scots. The new liturgy had been devised by a panel of Scottish bishops, including Archbishop Spottiswoode of St. Andrews, but a riot against its use was orchestrated in St Giles' Cathedral, Edinburgh, ostensibly started by Jenny Geddes. Fearing further measures on the part of the king, it occurred to Archibald Johnston (Lord Warriston) to revive the Negative Confession of 1581 in a form suited to the times. Together with the cooperation of Alexander Henderson, this National Covenant (as it was called) was finalized in early 1638. Additional matter intended to suit the document to the special circumstances of the time was added, primarily a recital of the acts of parliament against "superstitious and papistical rites" and an elaborate oath to maintain the reformed religion. The Covenant was adopted and signed by a large gathering in the kirkyard of Greyfriars Kirk in Edinburgh, on 28 February 1638, after which copies were sent throughout the country for signing. The subscribers engaged by oath to maintain religion in the form that it existed in 1580, and to reject all innovations introduced since that time, while also professing loyalty to the king. It did not specifically reject episcopacy but in effect undermined it. The year 1638 marked an apex of events for the Covenanters, for it was the time of broad confrontations with the established church supported by the monarchy. Confrontations occurred in several parts of Scotland, such as the one with the Bishops of Aberdeen by a high level assembly of Covenanters staging their operations from Muchalls Castle. The General Assembly of 1638 was composed of ardent Covenanters, and in 1640 the Covenant was adopted by the Scottish parliament, its subscription being made a requirement for all citizens. Before this date, the Covenanters were usually referred to as Supplicants, but from about this time the former designation began to prevail. The Covenanters raised an army to resist Charles I's religious reforms, and defeated him in the Bishops' Wars. The crisis that this caused to the Stuart monarchy helped bring about the Wars of the Three Kingdoms, which included the English Civil War, the Scottish Civil War and Irish Confederate Wars. For the following ten years of civil war in Britain, the Covenanters were the de facto government of Scotland. In 1642, they sent an army to Ulster in Ireland to protect the Scottish settlers there from the Irish Catholic rebels who had attacked them in the Irish Rebellion of 1641. The Scottish army remained in Ireland until the end of the civil wars, but was confined to its garrison around Carrickfergus after its defeat at the Battle of Benburb in 1646. A further Covenanter military intervention began in 1643. The leaders of the English Parliament, worsted in the English Civil War, implored the aid of the Scots, which was promised on condition that the Scottish system of church government would be adopted in England. Following considerable debate, a document called the Solemn League and Covenant was drawn up. This was in effect a treaty between England and Scotland which called for the preservation of the reformed religion in Scotland and the reformation of religion in England and Ireland "according to the word of God and the example of the best reformed churches", and the extirpation of popery and prelacy. It did not explicitly mention Presbyterianism and included some ambiguous formulations that left the door open to Independency. It was subscribed to by many in both kingdoms and also in Ireland, and was approved by the English Parliament, and with some slight modifications by the Westminster Assembly of Divines. This agreement meant that the Covenanters sent another army south to England to fight on the Parliamentarian side in the First English Civil War. The Scottish armies in England were instrumental in bringing about the victory of the English Parliament over the king. In turn, this sparked the outbreak of civil war in Scotland in 1644–47, as Scottish Royalist opponents of the Covenanters took up arms against them. Royalism was most common among Scottish Roman Catholics and Episcopalians, who were opposed to the Covenanters' imposition of their religious settlement on the country. The Covenanters' enemies, led by James Graham, 1st Marquess of Montrose and aided by an Irish expeditionary force and Highland clans led by Alasdair Mac Colla won a series of victories over hastily raised Covenanter forces in 1644–45. However, the Scottish Royalists were ultimately defeated in September 1645, at the Battle of Philiphaugh, near Selkirk. The disaster at Philiphaugh was largely due to the Royalists' own disunity and the return of the main Covenanter armies from England. The civil war in Scotland was a bitter episode which exposed the religious divisions between Presbyterians, Episcopalians and Catholics, the political divisions between Royalists and Covenanters and the cultural divisions between the Highlands and Lowlands. 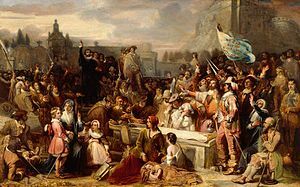 The end of the first civil wars in Scotland and England left the Covenanters hopeful that their Solemn League and Covenant would be implemented in the Three Kingdoms. However, Charles I refused to accept it when he surrendered himself to the Scots in 1646. He was taken to Newcastle, where several attempts were made to persuade him to take the Covenants. When this failed, he was handed over to the commissioners of Parliament in early 1647. However, many Covenanters, led by James Hamilton, were suspicious of their English allies' intentions and opened secret negotiations with Charles I. He made important concessions to them in the "Engagement" made with the Scots in December 1647. The Engagement was rejected by the militant Covenanters known as the Kirk Party, who wanted the king to endorse their agenda explicitly before an alliance could be reached. A Scottish army invaded England in support of the Engagement, but was routed at the Battle of Preston, leaving the Kirk Party in the ascendant in Scotland. The Westminster Confession of Faith, which had been submitted for ratification in 1646, was in part adopted by act of the English Parliament in 1648 as the Articles of Christian Religion, while in Scotland it was approved with minor reservations in August 1647 and ratified by the Scottish Parliament in February 1649. The Covenanters' insistence on dictating the future of both Scotland and England eventually led to all-out war with their erstwhile allies, the English Parliament, and to the Covenanters signing an alliance with Charles II known as the Treaty of Breda. Charles II, before landing in Scotland in June 1650, declared by a solemn oath his approbation of both covenants, and this was renewed on the occasion of his coronation at Scone in the following January. However, the Covenanters were utterly defeated in 1650–52 by the forces of the English Parliament under Oliver Cromwell. Lowland Scotland was occupied by the New Model Army and the Covenanters were sidelined. From 1638 to 1651 the Covenanters, led by Archibald Campbell, 1st Marquess of Argyll, had been the dominant party in Scotland, directing policy both at home and abroad. Their power had been seriously weakened, however, by Cromwell's victory at Dunbar in September 1650 and was practically destroyed after the Battle of Worcester and the English occupation of Lowland Scotland. Under Cromwell's Commonwealth, Scotland was forced into a temporary union with England and the General Assembly of the Kirk lost all civil power. Worse was to come for the Covenanters when Charles II was restored nine years later. Firmly seated upon the throne, Charles renounced the covenants, which in 1662 were declared unlawful oaths to be abjured by all persons holding public offices. Argyll himself was executed for treason, episcopacy was restored, James Sharp was appointed Archbishop of St Andrews and Primate of Scotland, the court of high commission was revived, and ministers who refused to recognize the authority of the bishops were expelled from their livings. Archbishop Sharp survived an assassination attempt in 1668 only to be killed by another group of Covenanters in 1679. Following the restoration of Episcopacy, rebel ministers began to preach at secret open-air meetings in the countryside known as "conventicles". A period of sustained persecution began. Oppressive measures against these illegal field assemblies where attendance was made a capital offence led to an outbreak of armed rebellion in 1666, originating in Galloway. Advancing from the west towards Edinburgh, a small force of poorly armed Covenanters was defeated at the Battle of Rullion Green in the Pentland Hills, a location which caused the whole tragic episode to be misleadingly named the Pentland Rising. To quell unrest in south-west Scotland, the government brought in 6,000 Highland soldiers, described by its enemies as an "inhumane and barbarous Highland host", which were quartered on suspected Covenanters and were accused of committing many atrocities. Inevitably, the government behaved harshly at first towards some of those caught in arms. On the initiative of James, Duke of Monmouth, who led the king's army to victory at Bothwell Brig, a more conciliatory policy was followed for a time, though this met with limited success. Through the period of repression the Covenanters held their convictions with a zeal that was only intensified by the persecution. For them it was a matter of belief. For the government, in contrast, the whole conventicle movement was seen as a problem of public order, which they attempted to deal with often using very inadequate resources. However, after the collapse of the 1679 rebellion a more dangerous element entered into the whole equation. In 1680 a more extreme mood appeared among sections of the Covenanter underground, which found expression in a document known as the Sanquhar Declaration. This was the manifesto of the followers of the Reverend Richard Cameron, soon to be known as the Cameronians. Hitherto, many in the Covenanter underground maintained an outward loyalty to the king, despite their opposition to the religious policy of his government; but the Cameronians took matters to a new height, renouncing their allegiance to Charles and denouncing his brother, James, as a papist. One extreme position inevitably led to another: the government in attempting to stamp out sedition authorized field executions without trial. This was the beginning of what Robert Wodrow later called the Killing Time. Cameron himself was killed in a clash with government forces at Airds Moss in July 1680, but his followers, now a tiny part of the Covenanter movement, continued to exist. After the accession of James VII in 1685 the King issued a series of Letters of Indulgence allowing such "ousted ministers as had lived peaceably and orderly to return to their livings". This succeeded in luring many ministers away from the struggle, but those remaining became more determined. When William of Orange summoned a Convention of the Estates which met on 14 March 1689 in Edinburgh to consider whether Scotland should recognise him or James, forces of Cameronians arrived to bolster William's support. In the subsequent Jacobite rising, the Cameronian Guard helped to defeat the Jacobite Highlanders, particularly at the Battle of Dunkeld. Although the Cameronians had helped to defend the Revolution, they were disappointed that their religious views were not adopted by the new government. The binding obligation of the National Covenant (1638) and the Solemn League and Covenant (1643) was passed over since the acts of parliament in favour of these had been rescinded by Charles and were not revived under William and Mary. For some Covenanters even William of Orange was an "uncovenanted" King since he was head of the Church of England which was an episcopal church. Perhaps 1000 people in the south west made an issue of the failure to maintain the covenants and also, with some justification, viewed the new establishment as tainted by Erastianism. They formed the United Societies refusing to recognise the "usurped" Church of Scotland. Though the rebellion had ended and a degree of Presbyterian tolerance for other faiths had been suggested by thanks given for James's Indulgence of 1687, for allowing all "to serve God after their own way and manner", memories of "the Killing Time" were now kept alive by monuments and tombstones at the many martyr graves across the south of Scotland, particularly the south west. "For the word of God and Scotland's work of Reformation. Scotland's heritage comes at a price which invokes our greatest heart felt thanks for the lives sacrificed on the anvil of persecution, when innocent blood stained the heather on our moors and ran down the gutters of our streets with sorrow and sighing beyond contemplation." Tombs are scattered around the moors and monuments were added later, for "if the authorities learnt that a murdered Covenanter had been given a decent burial, their bodies were usually disinterred and buried in places reserved for thieves and malcontents. Quite often the corpse was hanged or beheaded first", and burying the body in the kirkyard could result in another punitive death. 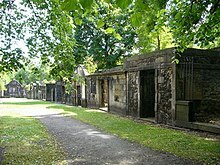 In 1707 a monument was erected at Greyfriars Kirkyard in Edinburgh, near the open ground known as the "Covenanters' Prison", where some twelve-hundred Covenanters were held captive after Bothwell. It gives a figure of 18,000 killed in the period 1661 to 1680, quoting an estimate which Daniel Defoe claimed was "Collected from the Accounts both Publick and Private" for his Memoirs of the Church of Scotland (1717). The History of the Sufferings of the Church of Scotland from the Restoration to the Revolution by Robert Wodrow, published in 1721-1722, produced a detailed record and denounced the persecution of the Covenanters. This martyrology would be brought forward again when elements in the Church of Scotland felt it to be suffering state interference, as at the Disruption of 1843. The United Societies continued without preaching, sacraments, or government until they were joined by one ordained minister in 1706, then in 1743 the Reformed Presbytery was organised. Covenanters fleeing persecution had set up churches in Ireland and North America and several small denominations were founded, including the Reformed Presbyterian Church. The "Burning Bush" emblem of the Church of Scotland bearing the motto "Yet it was not consumed"
From a religious perspective, "The king had been defeated in his attempt to dictate the religion of his subjects; Presbyterianism became the established religion. But it had been equally proved that the subjugation of the State to the Church, the supremacy, political as well as ecclesiastical, of the Kirk, was an impossibility. In this the Covenants had failed." While the exploits and the sufferings of these martyrs in the cause of religious dissent and scripture as the sole "infallible rule of faith and practice" are still remembered, often in a romantic light, their aim of denying the religious freedom they sought for themselves to other denominations is reflected in the terms of ministerial and Christian communion of some groups which include "an approbation of the faithful contendings of the martyrs of Jesus, especially in Scotland, against Paganism, Popery, Prelacy, Malignancy and Sectarianism." Many actual and supposed places of concealment of Covenanters are recorded and perpetuate the memory of the 'Killing Times' such as Dunton Cove on the edge of Eaglesham Moor on the Craufurdland Water, Cleeves Cove on the Dusk Water near Dalry and Peden's Cave on the River Lugar near Ochiltree. Covenanters started their migration to North America by way of Ireland. Having come to Ireland for religious, economic, and political reasons throughout the Seventeenth Century, Scottish Presbyterians, including Covenanters, once again for religious, economic, and political reasons felt compelled to migrate again. The migration is usually dated from the year 1717, when preacher William Tennent, founder of Log College, the first Presbyterian seminary in North America, came with his family to the Philadelphia area. In North America Covenanters became known as members of the Reformed Presbyterian Church. They were among the most vocal agitators for independence from Great Britain and volunteered in large numbers as soldiers in the revolutionary armies. The Covenanters were opposed to slavery, and in 1800 the Reformed Church voted to outlaw slave-holding among its members. In the summer of 1643, the Scottish parliament and General Assembly of the Church entered into negotiations for an alliance with the English Parliament. Historians have concentrated on the clauses of the Solemn League and Covenant, the treaty which resulted from those deliberations. "Following the outbreak of the Civil War in England, in 1642, a committee of noblemen and clergy from both Scotland and England composed a document entitled the 'Solemn League and Covenant'. It was signed between September and October, in both countries, and later in the same year, in Ireland. This committed the Scots to supply an army to aid the Parliamentarian Par against the Royalists in the Civil War. As in the National Covenant, the signatories pledged to 'amend our lives, and each one to go before another in the example of a real Reformation'. As with the National Covenant they entered into a mutual contract with God where the signatory promised to reform his or her person, in this case, not only for the upholding of 'the Religion', but that 'the Lord may tu away his wrath, and heavy indignation'. (All quotations are from 'The Solemn League and Covenant', reprinted in SB, ILL, pp.122-5). The success of the Scottish National Covenant was thought by many sectarians and clergy alike to have been the direct result of the process of mutual bonding between the nation and God. Thus, at a time of rising religious schism, a threatened invasion of Irish Catholics and Royalist-Parliamentarian hostilities, the English Parliamentarians bound themselves to the same course that had appeared to guarantee the Scots 'virtually unmitigated success' (Edward J. Cowan, 'The Making of the National Covenant', in John Morrell, ed. (1988), p.75). ^ MacPherson, Hamish (14 November 2017). "How the defiance of the Covenanters changed history". The National. Retrieved 17 August 2018. ^ MacPherson, Hamish (21 November 2017). "How the Solemn League and Covenant of 1643 changed our islands forever". The National. Retrieved 17 August 2018. ^ a b c "The Covenanters, The Fifty Years Struggle 1638-1688". Sorbie.net. 1920-07-26. Retrieved 2012-05-14. ^ a b "Greyfriars Kirkyard, Edinburgh". Covenanter.org.uk. Archived from the original on 2013-05-13. Retrieved 2012-05-14. ^ a b c Covie. "Who are the Covenanted Reformed Presbyterian Church?". Covenanter.org. Archived from the original on 2012-06-09. Retrieved 2012-05-14. ^ "Wodrow, Robert". ScotlandsPeople. Retrieved 2012-05-14. ^ McMillan, William (1950). "The covenanters after the Revolution of 1688". Scottish Church History Society: 141–153. Retrieved 25 August 2018. Cowan, E. J. The Solemn League and Covenant, in Scotland and England, 1286-1815, ed. R. A. Mason, 1987. Cowan, I. B. The Covenanters: a Revision Article'' in The Scottish Historical Review, vol. 28, pp43–54, 1949. Currie, Janette (2009). History, hagiography, and fakestory: representations of the Scottish Covenanters in non-fictional and fictional texts from 1638 to 1835 (Thesis). University of Stirling. Furgol, E. M. (1983). The religious aspects of the Scottish Covenanting armies, 1639-51 (Thesis). University of Oxford. Hewison, J. K. The Covenanters, 2 vols. 1913. Kiernan, V. G. A Banner with a Strange Device: the Later Covenanters, in History from Below, ed. K. Frantz, 1988. Love, Dane. Scottish Kirkyards, 1989 (Robert Hale Publishers, London). Mathieson, W. L. Politics and Religion: a Study in Scottish History from the Reformation to the Revolution, 2 vols, 1902. Scott, Sir Walter. The Tale Of Old Mortality, 1816. Stevenson, D. The Scottish Revolution, 1637–1644, 1973. The Covenanters. A Poetic Sketch by Letitia Elizabeth Landon in the Literary gazette, 1823.